Northrop Grumman Mission Systems is searching for a Sr. 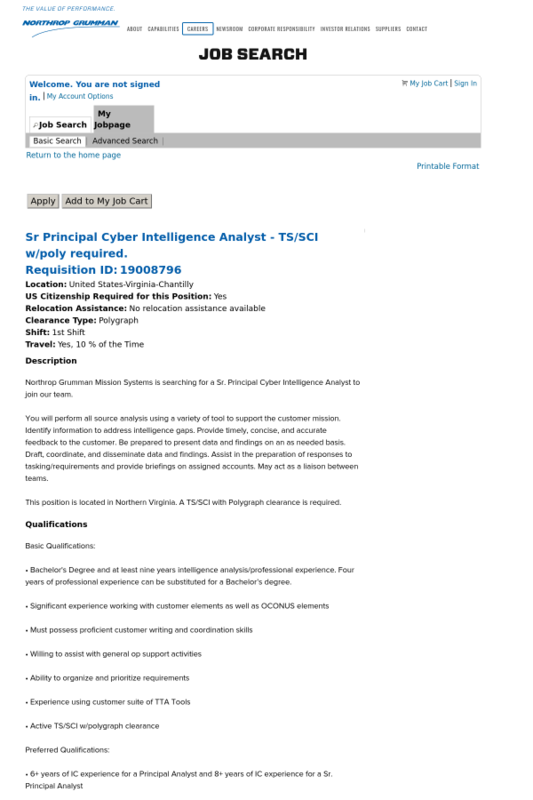 Principal Cyber Intelligence Analyst to join our team. You will perform all source analysis using a variety of tool to support the customer mission. Identify information to address intelligence gaps. Provide timely, concise, and accurate feedback to the customer. Be prepared to present data and findings on an as needed basis. Draft, coordinate, and disseminate data and findings. Assist in the preparation of responses to tasking/requirements and provide briefings on assigned accounts. May act as a liaison between teams. This position is located in Northern Virginia. A TS/SCI with Polygraph clearance is required. • Bachelor's Degree and at least nine years intelligence analysis/professional experience. Four years of professional experience can be substituted for a Bachelor’s degree.